Linda was a retired teacher and member of the Northside Baptist Church in Grayville. She enjoyed quilting and flower gardening. Survivors include husband, Chuck Turner; son Jeff (Stefanie) Turner; daughter Jennifer Neal, all of Grayville; sisters Martha Fulkerson of Norris City, Illinois, Connie Stenger of Eugene, Oregon, Betty (John) More of Benton, Illinois, Nadine (Ben) Meeker of Vashon Island, Washington; grandchildren Joshua Turner, Samantha Wimberly, and Megan Neal. She is preceded in death by her parents; son Michael E. Turner; and brother Ralph Martin, Jr. In keeping with Linda’s wishes, her remains were cremated. A visitation and memorial service are Sunday, February 10, 2019, at Cook Funeral Chapel in Grayville. Visitation is 1-3 pm, and memorial service is at 3 pm. Burial will take place at a later date in Walnut Grove Cemetery near Brownsville. Memorials may be made to the Grayville Senior Citizens Center and will be accepted at Cook Funeral Chapel in Grayville. Memorials: Memorials may be made to the Grayville Senior Citizens Center and will be accepted at Cook Funeral Chapel in Grayville. I am very sorry for your loss. 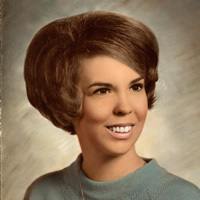 I was one of Linda’s classmates at NCOE, 1965. So sorry to hear this. I remember when we lived next door to each other. Such a nice lady. My deepest sympathy to Chuck and the whole Turner family. I’m so very sorry to hear this! Thoughts and prayers are with you all. Love, Rita Hosman and family! So sorry for your lost Chuck. Me and the boy’s have you in our prayers. So sorry to hear of Linda’s death. Amazing wife, mother, grandmother and friend. Lovely lady who touched many lives. Prayers for you all.